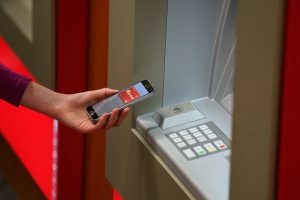 Wells Fargo & Company say that debit card customers can use the company’s ATMs without their card with NFC functionality that is launching at more than 5,000 ATMs across the US. The feature is activated using a mobile phone’s mobile wallet feature. Today, more than 40% of Wells Fargo ATMs have functioning NFC capability, with the goal of upgrading the rest of the company’s more than 13,000 ATMs with the hardware by 2019. Customers can already access any Wells Fargo ATM without a physical card by generating a one-time access code through their Wells Fargo Mobile Banking app. With the launch of one-time access code in March 2017, Wells Fargo became the first large bank in the US with an entire fleet of card-free ATMs. “This spring’s launch of one-time access code technology at all Wells Fargo ATMs has resulted in nearly three million card-free ATM access code transactions. Card-free ATM use will take another leap as we introduce NFC functionality,” comments Jonathan Velline, head of Strategy and Administration for Community Bank.